When someone first becomes aware of this phenomena, it can be a very unsettling time. Look-Up tries to help you manage this process by giving you all the information you need to know to answer those initial questions simply and concisely, and then to point you towards further information, both here and in other forums and organisations, depending on how you want to deal with that information. It has been prepared over time, based mostly on our own investigations. We do not simply regurgitate material we find online like most other pages, and indeed have become a global leader in new information and hypothesis in this field. The site attempts to be a source of useful information for everybody, from those who have just become aware of it, to those who are already knowledgeable about the subject and are simply trying to source the latest information and ideas about what is going on. This subject is large and complex, and the first steps to finding out about it can be overwhelming, both in terms of the amount of information there is to absorb and the emotional journey many people undergo, but also the amount of disinformation available online. The official line seems to be one of trying to gently ease the public into accepting Climate Engineering, without having to make any public admission of its existence, or carrying out any public consultation or approval process whatsoever. We suspect the reason for this is that the public are highly unlikely to approve it, and the process involved in asking them to do so would be long and tumultuous, so they seem to be trying very hard to slip it under the public radar. Incredible as that sounds, they also seem to be succeeding at this. 60-70% of the people we speak to have simply accepted the presence of vapour trails as an integral part of our daily weather. This is truly mind-boggling to us. 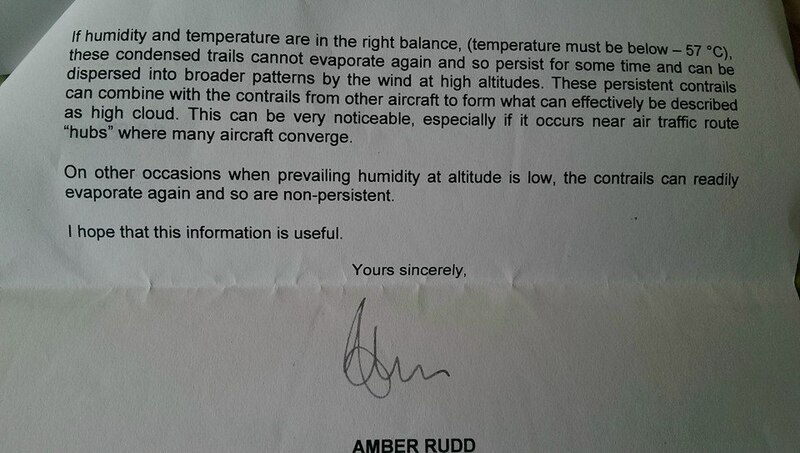 Planes have never defined our weather and never should. Think about this. If planes had always left trails, The MET Office would acknowledge them as part of our weather forecast, especially as some days are entirely defined by vapour trails, from dawn spreading trails, all though until the evening. This is not normal at all and has only started to happen slowly over the past 10 years, so why are people just accepting this. The following image is a perfect example of what we mean. This was taken in the North Wales area and shows clearly the progression from just a few spreading trails to what we now call a white out. This can happen in as little as a few hours and involve as few as 15-20 aircraft. Even if this were just water vapour, it would demand immediate action from the CAA and NATS to route aircraft away from populated areas, but what we see is planes actually being routed out of their way to pass over populated areas. Need we say more? The crux of this site, and campaign as a whole, is to ensure enough people know the truth about what is really going on, so we can stop them in their tracks when the issue finally reaches the public consciousness in large enough numbers for it to have to be acknowledged by government. Obviously we are also trying very hard to speed that process up with regular campaigning. Crucially we are also recording any demonstrations we do, so as to have a record of societies disapproval of the situation. 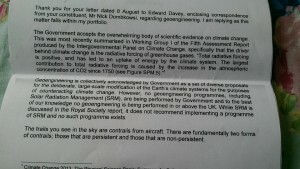 This is very important, as we now believe that the organisations involved are preparing to attempt to make Climate Engineering legal (if it is currently illegal) by claiming they have consulted us and we have not objected. 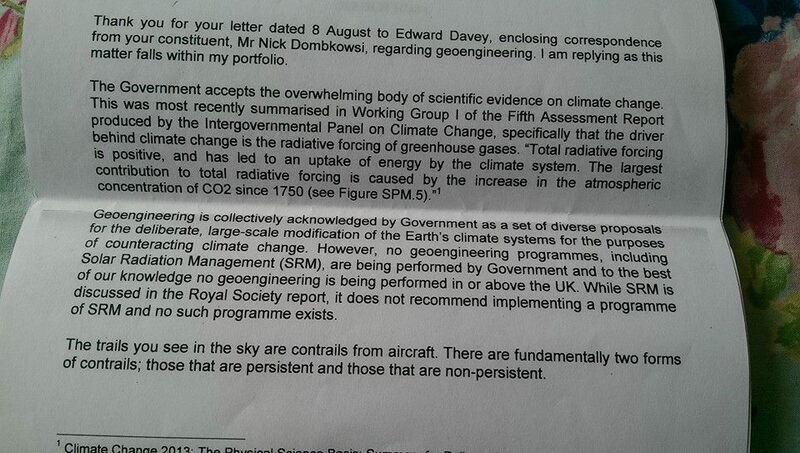 We got wind of this at the Climate Engineering Conference in Berlin in August this year. We don’t know the exact details, but that is very worrying indeed. We think that speaks volumes. 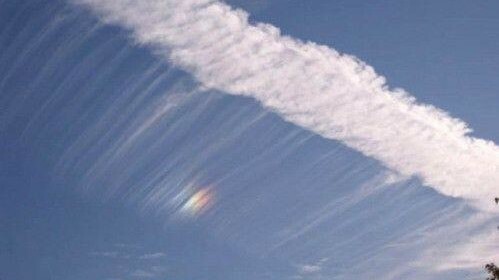 We must act soon to try to avert the introduction of a Climate Emergency, which we believe is utterly fictitious, to allow those behind the current programs to gain approval to spray our skies legitimately. If that happens it will be much harder to stop. Please try to source as much information as you can on this website. There are other forums but sadly over time we have come to realise that they all have drawbacks, and some we feel are just suspicious. Many of them use a dramatic style of presenting this topic which we do not feel it is the best way to reach the British people and thinkers generally. Other forums mix up, deliberately we feel in some cases, nonsense such as homeopathy, crystals, aliens and other such rubbish with this very serious topic and use terminology we do not agree with and promote extreme ideas which we do not feel are conducive to raising awareness among the average people of the UK, which is what we need to do if we are to bring an end to this. Sadly our menu system is not ideal due to us having a rather rubbish web hosting and management firm but we are stuck with it for now. There is a lot of content, so if you just want to read the latest stuff then the top article in each menu and sub menu is the latest. Even easier is to bookmark or drag a link to out blog onto your desktop and check in regularly. Please do take the time to read up. We feel nothing is more important than protecting our sunshine and the air we breathe from corporate control and contamination.